The Woodend beat of the famous River Dee is in the heart of Royal Deeside and is situated about 4 miles west of the popular small town of Banchory. The beat, which fishes two rods, is just over a mile long on the north bank and consists of 11 named pools, including the Moral Pool described by John Ashley Cooper as one of the most famous pools on the Dee. The beat is accessible by car as there is a rough track which runs the full length. There is also a secure rod room in which to store fishing equipment. Woodend lies in the heart of Royal Deeside 3 miles west of Banchory. 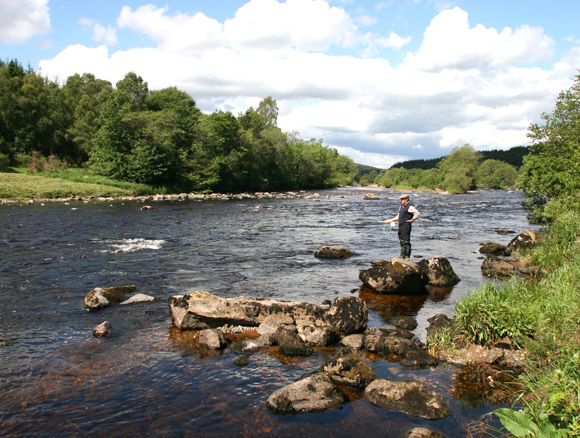 It is totally secluded and provides 1 ¼ miles single bank fishing on one of the most famous and beautiful beats on the Dee. There are 11 named pools including the renowned Moral Pool which has been described as one of the most beautiful and prolific on the river. A rod room is available for securing equipment and a hut (with wood burning stove) for lunches and shelter. Fishing is by fly only and by general agreement of the Dee proprietors, a catch and release code is in force. A ghillie is available if needed by separate arrangement. Garden Cottage is less than 100 yards from the river, in private grounds and includes kitchen, living room, 2 twin bedded rooms and a bathroom. It has central heating and TV. It provides very convenient and comfortable accommodation. Accommodation is sometimes available in Woodend House on a half board basis. 2 twin rooms and 1 double room. Prices on request. Picnics can be arranged to suit.